On November 1, 2017, the Centers for Medicare and Medicaid Services (CMS) issued its final CY 2018 payment rate regulation for hospital outpatient departments (HOPD) and ambulatory surgery centers. There are several issues that merit the attention of the ophthalmic ASC community. OOSS will continue to lobby strenuously for ASC rates to be updated by the Hospital Market Basket, which is used as the cost of living adjustment for HOPDs and is typically about a point higher. In our comments to the agency, the ophthalmology and ASC communities supported the adoption of an ASC quality measure on TASS, which was developed by the ASC Quality Coalition (on whose Board OOSS sits). Regrettably, CMS did not finalize adoption of this measure, citing concerns regarding the low incidence of TASS and its applicability to most facilities. In the final rule, as recommended by OOSS, CMS removed three current measures: ASC-5, Prophylactic Intravenous (IV) Antibiotic Timing; ASC-6, Safe Surgery Checklist Use; and, ASC-7, Facility Volume Data on Selected Procedures. In the proposed rule, CMS requested comments on whether the agency should establish a new Level 2 Intraocular Procedures C-APC that encompasses CPT 66982, complex cataract surgery. The division of cataract surgery into two C-APCs would have resulted in an increase in payment for CPT 66982 but a decrease in CPT 66984 and other related services. 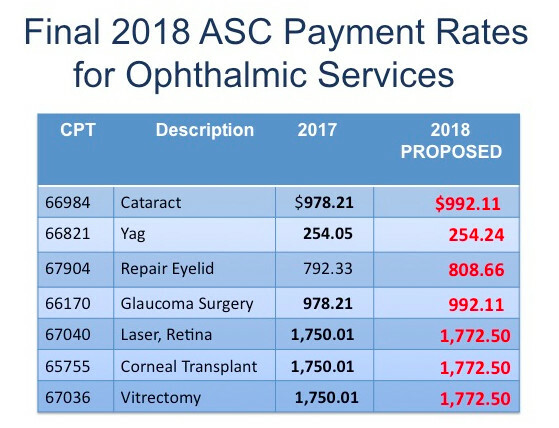 OOSS argued that CMS should not establish a separate C-APC for complex cataract because of the variation in resource costs from facility to facility and the clinical coherence of standard and complex cataract surgery. CMS agreed with the position articulated by OOSS and other ophthalmic groups and is not moving forward with its proposal to establish a new C-APC for complex cataract. CMS solicited comments in the proposed rule regarding the agency’s packaging policies under the hospital outpatient payment system, including drugs that function as a supply in diagnostic or surgical procedures. OOSS, ASCRS and SEE recommended that CMS develop a policy that covers — separately under Part B — drugs that are administered at the time of cataract surgery, but are not integral to or necessary for the cataract procedure, and have an FDA-approved indication to treat or prevent post-operative concerns, such as pain and inflammation.